ShutterstockThe choice of materials makes a big difference in how much you'll spend on a kitchen remodel. 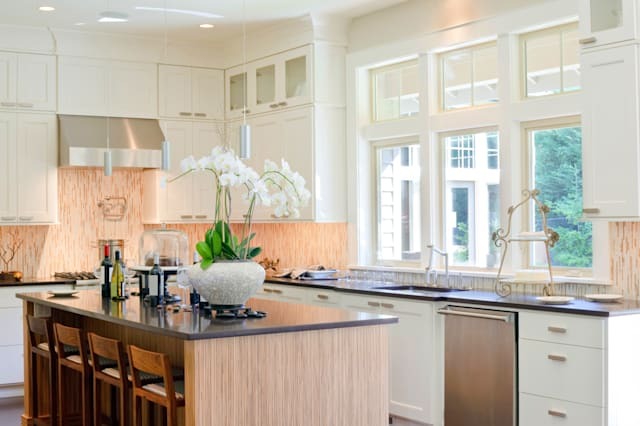 We always hear that remodeling a kitchen is one of the most expensive home improvements. And it can be. The Remodeling 2014 Cost vs. Value Report listed the average cost of a major kitchen remodel at $54,909, and even a minor remodel came in at $18,856. But kitchen remodeling doesn't have to be that expensive. "If you take it piece by piece, you can do something good on a budget," says Aimee Grove, a communications and marketing specialist in the San Francisco area. She and her husband have remodeled two kitchens on a budget. "I have my dream kitchen now," she says. "I wouldn't change a thing." The choice of materials makes a big difference in how much you'll spend. Custom-made, solid-wood cabinets with a premium finish and decorative molding can easily cost $1,200 or more per linear foot, which is the way cabinets are normally priced. But you can get attractive cabinets at Ikea or even a local shop for a quarter of that cost if you shop around. And while granite countertops definitely cost more than laminate, if you visit enough stores, you'll learn that granite itself varies widely in price. "We went to 10 different marble places until we found the slab we wanted at the right price," Grove says. They found that it really pays to shop for materials and labor. For example, the price of the marble they wanted varied from $80 to $13 per square foot, and the fabrication quotes ranged from $3,200 to%VIRTUAL-pullquote-"If you have the capabilities to be the general contractor yourself, you can definitely save some money. "% $6,000. Quotes to paint their cabinets ranged from $1,500 to $7,000. Tile, both for flooring and backsplashes, can run $1 to $15 per square foot. You may find the cabinet hardware you liked most in the store for half the price online. Danielle Colding, who runs Danielle Colding Design in Brooklyn, New York, recently redid her kitchen with sleek, ultramodern gray lacquer cabinets from Ikea. "They're really affordable," she says. "You can do a normal kitchen for $4,000 to $5,000." Colding, who won HGTV's "Design Star" competition in 2012 and also hosted "Shop This Room" on the network, says local shops can also be an excellent option when remodeling on a budget. Grove and her husband chose to act as their own contractors, hiring separate painters, marble fabricators and tile installers. They gathered names from a contractor friend and the marble yard, and then asked those companies for bids and references. Being your own contractor creates more work because you're screening multiple contractors rather than just one general contractor for the entire project. Plus, you have to be available during the day to supervise, and you have to shop around to find the best price on supplies. But for someone whose remodel doesn't include knocking down walls, reconfiguring the layout or dealing with city permits, appointing yourself contractor can be a way to cut costs. "If you have the capabilities to be the general contractor yourself, you can definitely save some money," says Jason Kloesel, owner of VK Construction and Remodeling in Austin, Texas. "If you don't have the smallest construction knowledge, I would not recommend this at all." Keep your plumbing and gas lines in the same place. A kitchen remodel costs considerately less when you don't change the layout. Don't assume big-box stores have the lowest prices. A local cabinetmaker, in some cases, may offer a better deal than the larger competition. Consider used. Entire kitchens are routinely sold on Craigslist and at the Habitat for Humanity ReStore as well as architectural salvage stores. Hiring a local cabinetmaker to create a piece or two is much cheaper than creating an entire kitchen. "It's used, obviously, but it's usually very high-quality," says Cathie Pliess, design program coordinator for the Art Institute of Fort Lauderdale. Look for remnants of granite and marble. Most fabricators have stone left over from previous jobs, and they'll often sell it for a fraction of the original cost. Make friends with cabinet shops. Once they're finished with a display, it is sold at a deep discount. And don't forget about big-box stores. You can score deals on cabinets by being friendly with them, too. Don't skimp on planning. The exact layout of the kitchen and choice of cabinets will make a big difference in how well your kitchen functions. Find out where contractors shop. Many of those stores and fabricators are open to the public. Some offer discounts for bigger purchases, and many sell products that aren't available in retail stores. Paint when possible. Know that paint is cheaper than stain, and that goes for the labor, too. "People shouldn't overlook what a difference it makes to paint your cabinets," Pliess says. Consider alternative materials and designs. You can take the doors off the top cabinets or repurpose old furniture as kitchen storage or to create an island, Pliess suggests. Beadboard creates an attractive, inexpensive backsplash. And you might be surprised at today's laminate countertops. "Laminate has come a really long way," Pliess says. "It doesn't have that ugly laminate look anymore."